• A visit to the Anna Miller Museum in Newcastle offers a wonderful trek through history! 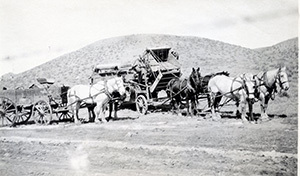 Newcastle, Wyoming, took roots on Sept. 10, 1889 when the Lincoln Land Company, a subsidiary of the Chicago, Burlington and Quincy Railroad (CB&Q), sold lots at auction. The discovery of coal near Cambria (located north of Newcastle) in 1887 by Frank Mondell, earned the railroad mangers’ attention and CB&Q built a seven-mile spur from Newcastle north to Cambria. Kilpatrick Brothers & Collins Commissary, now The Antlers in downtown Newcastle, was the community’s first substantial building. During the Battle at Wounded Knee in 1890 the building was fortified and stocked with ammunition. The windows were barricaded with sacks of flour. That same year, 1890, eleven more buildings were added. Several remain standing in the historic downtown area to this day. Isabella’s Restaurant and the new Miners on Main Bar & Grill are also housed in one of the community’s more historic structures! Truly a wild west town in its early days, Newcastle’s very first ordnance prohibited the firing of guns within the city limits. The community was home to 14 saloons, numerous dance halls, prostitutes and gambling. Although the Blacks Hills were reportedly the first area of Wyoming to be explored, in many ways they were also the last. Joseph and Francois Verendrye, French-Canadian explorers, visited portions of Montana and northeastern Wyoming as early as 1743. It wasn’t, however, until the railroad later arrived that the area was populated by more than trappers, a few stockmen and some road agents along the Cheyenne to Deadwood stage route. To learn more about Newcastle’s history, consider visiting the Anna Miller Museum, housed in the community’s historic cavalry stables at 201 Delaware Avenue. More detailed articles are also available at WyoHistory.org and at WyomingTalesandTrails.com.